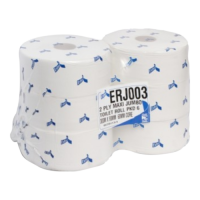 Jumbo toilet rolls are a type of high capacity toilet tissue roll used commercially due to the economy of product in use. Available as mini jumbo rolls that are between 150-200 metres long and maxi jumbos that are 300-400 metres long. These types of toilet rolls are extremely popular in high footfall volume public toilets such as public houses, restaurants, attractions etc. 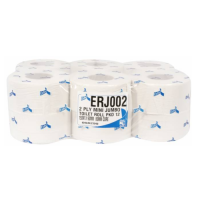 A 300m 2-Ply virgin tissue maxi jumbo toilet roll with a 60mm core siz..
A 300m 2-Ply virgin tissue maxi jumbo toilet roll with a 80mm core siz..
A quality 150m 2-Ply mini jumbo toilet roll with a 80mm core manufactu..
A 400m 2-Ply virgin tissue maxi jumbo toilet roll with a 60mm core siz..